Hal Holmes, ’18 UW Bioengineering Ph.D. graduate of Professor Karl Böhringer’s lab, has been named as one of 14 members of the inaugural 2018-19 class of Schmidt Science Fellows. The postdoctoral training program aims to expand the horizons of the next generation of leaders and innovators in the natural sciences, engineering, mathematics and computing. It promotes the development of interdisciplinary researchers who have the tools and opportunities to drive world-changing advances in science and society. Fellows are placed in a research environment outside their area of expertise, and will gain exposure to new science and technology, novel ways of thinking and a broader community of scientific collaborators. They will each receive a $100,000 fellowship and funding to attend four international meetings for scientific exchange and networking. Dr. Holmes will work at Virginia Tech to advance development of technology for combatting illegal timber and wildlife trafficking. With this project, which he sees as an evolution of his thesis work in the Böhringer lab, he aims to develop a new method for accessing DNA from difficult-to-identify sample types. His goal is to develop a field-deployable screening device that enables non-technical users, such as custom officers, to identify if a product was sourced from an endangered or protected species. Read more about Dr. Holmes’ work. 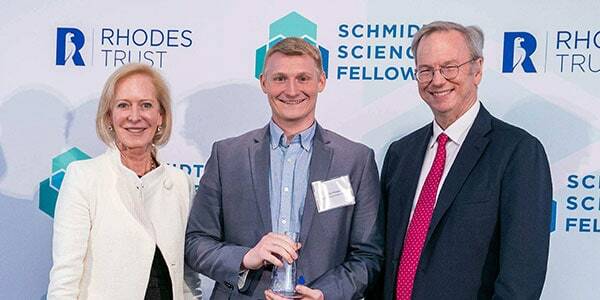 The Schmidt Science Fellows program is a joint effort of Eric and Wendy Schmidt and the Rhodes Trust, home of the prestigious Rhodes Scholarships. It was founded via an initial commitment of $25 million for the first three years, and kicks off a broader $100 million effort by the Schmidts to promote scientific leadership and interdisciplinary research over the next decade and beyond. Eric Schmidt is technical advisor to Alphabet, Inc., parent company of Google, and its former executive chairman. Wendy Schmidt is President of the Schmidt Family Foundation and cofounder of the Schmidt Ocean Institute.